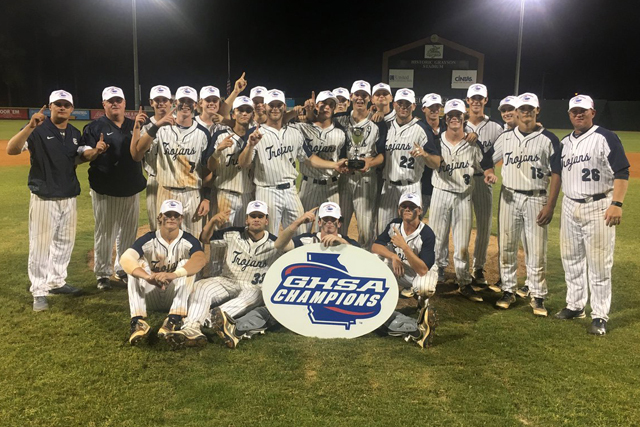 On three previous trips to the Georgia High School Association state baseball championship series, Gordon Lee and coach Mike Dunfee came away empty handed. Perhaps no trip was more painful than last season when Schley County swept the Trojans to deny them the Class 1A Public School state championship in Rome. But in what must have seemed like thousands of miles away from home on the Georgia Coast, Gordon Lee turned historic Grayson Stadium in Savannah into its home-away-from-home Tuesday night, sweeping Telfair County by the scores of 10-0 and 7-1 to bring its first state baseball championship back to Chickamauga since 1984. After finishing as the state runner-up three times in a five-year span, Gordon Lee (28-8) was denied no more. And for those former players who came up short, this one was for them. The Trojans rolled in Game 1, using the same combination that got them to the state championship series - contact hitting and shutdown pitching. Caleb Hopkins allowed just two hits and struck out four to earn the five-inning victory on the mound. He benefited from an eight-run second inning that gave him all the run support he needed. Gordon Lee finished the first game by scoring 10 runs on 11 hits. Dylan Minghini, Hopkins, JD Day and Will Sizemore finished with two hits each to lead the way. Minghini's double in the second inning scored a pair of runs and broke the game open. He finished with three RBIs. Gordon Lee added two more in the bottom of the fifth to end the game on the mercy rule. The nightcap started out to be a pitcher's duel between Gordon Lee's Mason Pettigrew and Telfair County's Ian Blankenship. But Telfair grabbed a 1-0 lead in the bottom of the fourth on Ryan Dopson's RBI single that scored Cameo Blankenship. But Gordon Lee scored a pair of runs in the fifth to take the lead on back-to-back doubles from Sizemore and Woody, then they added five more in the fifth to take a commanding lead. Austin Thompson provided the biggest blow with his two-run RBI triple. Pettigrew and Jake Wright worked three innings apiece with Thompson working the scoreless seventh to preserve the victory. The trio allowed just an unearned run on five hits. Telfair County, making its first appearance in the state baseball championship series, finished with a 24-10 record.